Well, I'm still here in Sydney without my bag...but I did buy some new clothes. I have been taking time to go into the city and do some of the same things I've done before. I've gone without my camera...my little one is in my "lost" bag. Yesterday I went on a whale watching cruise. We saw one little lousy whale...humpback. It did one little tail smack and that was about all. I do have a picture I might post later. I stayed in the city till dark and got a few new pictures. 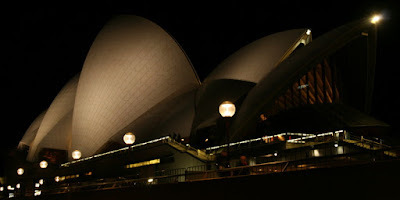 The first is the Opera House and the second is of the Opera Bar on the concourse underneath the Opera House. This is a busy place normally full of tourists...of course. 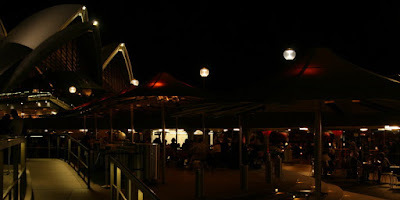 There are shops and restaurant/bars all long this side of Circular Quay, pronounce that "key". Of course there is a great view of the Sydney Harbour Bridge from here. I have a few of those I might post at a later date. This is all for now. I'll be leaving Sydney for Houston on Tuesday. I'll try and post once or twice more before then.